Flare Fireplaces are taking extreme measurements to assure all products are tested and verified and are free from defects prior to leaving our warehouse . Our Factory is subject to high quality standard and is under the supervision of the CSA organization. 1 year Limited Warranty on the gas valve, remote, pilot burner assembly, electric components and fan motors,interior decorative media. Flare warranty shall be effective only if the original purchaser of the fireplace appliance is registered with Flare Fireplaces within thirty days of the date of purchase. Minor warping of certain parts or discoloration is normal and is not considered a defect that is covered by this warranty. Major disruption and buckling of parts can be caused by over-firing of your Fireplace. Over-firing above rated value specified in the manual is contrary to the manufacturer’s instructions and may void this warranty. Installations must be done in accordance with the appliance manual. The Limited Warranty applies only if the product is installed in the United States or Canada and only if installed, operated and maintained in accordance the attached product manual. Warranty coverage begins on the date of original purchase. Any part that is found in our judgment to be defective shall be repaired, replaced or refunded at Flare Fireplaces option. This warranty only covers Flare Fireplaces appliances that are purchased through a Flare Fireplace authorized dealer or distributor. 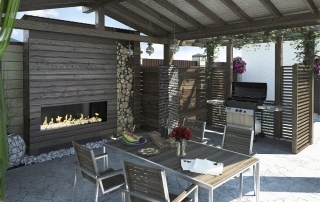 The warranty is only valid while the Flare Fireplace appliance remains at the site of original installation. the nearest Flare Fireplaces authorized dealer or supplier. the nearest Flare authorized dealer or supplier. The appliance has been over-fired or operated in atmospheres contaminated by chlorine, fluorine, or other damaging chemicals. Over-firing can be identified by, but not limited to, warped plates or tubes, rust colored cast iron, bubbling,cracking and discoloration of steel or enamel finishes. hols have been drilled in to the fireplace for any reason. Flare Fireplaces is not responsible for televisions, mantles, surrounds or finishing material around the fireplace. Flare Fireplaces may at its discretion discharge all obligations by refunding the wholesale price of the defective part. The Limited Warranty covers only parts and labor as provided above. 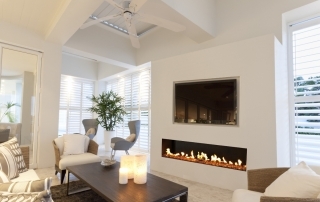 Flare Fireplaces will not be responsible for materials, components or construction, which are not manufactured or supplied by Flare Fireplaces or for the labor necessary to install, repair or remove such materials,components or construction.